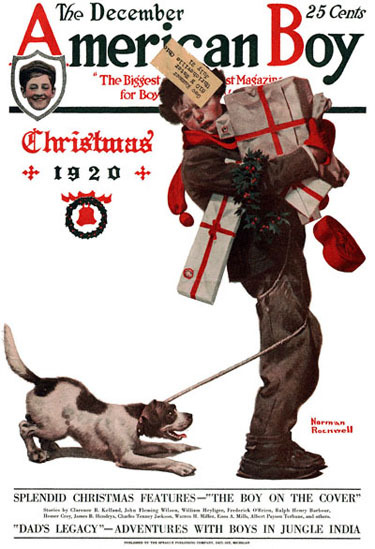 Christmas Packages, this Norman Rockwell painting, appeared on the cover of American Boy published December 1920. This was the fifth and final picture by Rockwell to appear on the American Boy cover. American Boy only published five Rockwell covers, all between 1916 and 1920. In this painting, Norman Rockwell paints two of his favorite subjects: a dog and a boy. He depicts these two in a Christmas scene. Rockwell's Christmas paintings are oftentimes his most touching. We see this boy returning home after shopping. He is loaded with presents already nicely wrapped and ready to go under the tree. Either he took his dog with him when he was shopping or he has picked the dog up on his way home. Now the dog wants to play. The dog's leash has gotten wrapped around the boy's legs. He is trying to maintain his balance. He has turned his head and is scolding the dog. The nicely wrapped presents are dropping, one by one, to the ground as the boy tries to maintain and regain his balance. He will be very upset when he realizes that the red heart-shaped box has fallen. That box may no longer look presentable after it crashes to the ground. Is there a tragedy brewing? Is that red heart-shaped box a gift for his sweetheart? Maybe that is why the dog is making the boy drop presents. Maybe he is jealous.